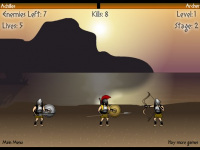 An action-arcade game that features a solo fight between a Greek hero, Achilles, against enemy armies. There are five levels available in normal mode, each level consists of three stages. The third stage presents the boss with higher abilities. Achilles can perform attacks using a sword and spears. He can also grab a spear on the ground, and you can make him throw the spear from any distance by pressing T button while walking towards the opponent. Blocking an attack is performed by pressing the down arrow button. Arrow keys = Walk, Jump. Down Arrow Key = Block, Grab a spear. Flash game of Prince of Persia featuring fast-paced jump-attack-run gameplay. Run and jump through a cave world with two sides of gravity.